Today’s episode of Between 2 Term Sheets features a conversation between Ben Narasin and Alacrity Canada Chairman Owen Matthews. 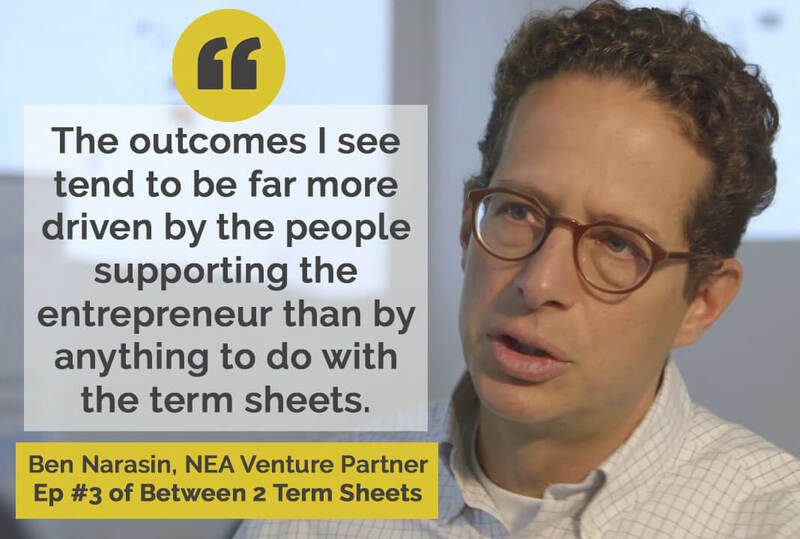 Ben Narasin, Venture Partner at NEA, is one of Silicon Valley’s most successful institutional seed-stage investors. Starting off as an entrepreneur himself, Ben founded one of the first e-commerce companies, FashionMall.com, which he led to a successful IPO in 1999. Following the IPO, Ben moved from New York to the Valley where he sought to help fill the gap between ‘angel’ and ‘venture’, investing in 80 companies over 10 years, many of which went on to raise series A and beyond from tier 1 firms. Ben is currently a venture partner at NEA which he describes as “the single best venture firm in the world”. In this episode, Ben and Owen chat about the difference between angel investing and institutional seed investing, how founders should look for early stage investors that can prove a stepping stone to later stage investment (hint: value, not just capital), early signs of a messy deal, the current fundraising climate in Silicon Valley, how non Silicon Valley companies can gain enough credibility to attract the attention of investors in the Valley, and more. Be sure to head to PitchBen.com for the opportunity to let Ben know of your company.